customized in full color tees to your needs, including logo, name… nearly anything you need! your message to the logo and make a special personalized gift! amusement park,chain stores,florist,retail stores,charities,fundraising,promotion customers. Ms teddy bear is made from quality of plush and is soft stuffed. 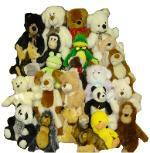 You can enjoy shopping in our all stuffed animals sections. Ms teddy bear can make your stuffed animals order with more personalized choices. You can decide the best way for your gift,corporate,promotion and charity purpose. Copyright © 2005-2013 MS Teddy Bear Inc. All rights reserved. Ms teddy bear has many different stuffed animals in stock. Like our teddy bears, they are all good quality and style for many purpose.